In a world of hundreds of Thousands of Android applications, I have ‘discovered’ an Application that is actually relevant … that works for me. M-Pesa is arguably the greatest innovation of our time, a revolution in mobile banking. Any banking has to have a trail, though-bank statements, a transaction history, among other reports. M-Pesa has been lacking these, and sometimes all you have to show for your transaction is an SMS-which you may lose! Granted, Safaricom Self care is now solving some of these, at least you can now get your statement. But that’s still basic! This is where M-CashBook comes in! M-Cashbook is a mobile phone application intended for M-PESA mobile money transfer users in KENYA, designed to help you keep and easily view your MPESA transactions-even if you lose the MPESA confirmation SMS messages. MCashBook will automatically save your MPESA transactions on your phone immediately the MPESA confirmation message is received by your phone. Transactions that were previously done prior to installation of MCashBook on your phone and are still in your inbox can be scanned and saved by the application. MCashBook will also enable you to backup all your MPESA messages in your inbox to an excel file that you can transfer by bluetooth or email to your PC. 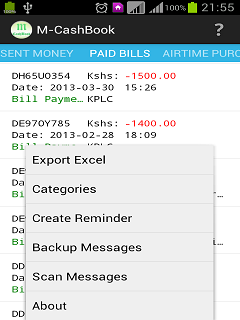 So, MCashBook can be used by both MPESA users and MPESA agents to keep,manage and backup their MPESA transactions. Export MPESA transactions to excel. Organise transactions into different categories. Scan messages for and retrieve MPESA messages. Group transactions into categories i.e. Deposits, Withdrawals, Bill payments e.t.c. Handles both MPESA client transactions as well as MPESA Agent transactions. Summary and transaction details reports. I have tried all these, and yes! It works perfectly! How safe is this app? phone and not on an external site – so your transactions are safely with you. Hi Frankline, this is damn brilliant, what if I am an agent using a basic Nokia phone in my Transactions and I still need to back up and access the messeges through my PC, how do I go about it? Hi, does the app still exist? Or any other app that can categorize m pesa transactions. Thanks for any help!